I found this story today! As if Colorado residents don't have enough snow to dig out from, one resident is offering more for a price on eBay. Starting bids were holding steady Friday at 99 cents for snow from "Blizzard I and Blizzard II" being offered by Mary Walker. She and husband, Jim, got the idea for selling snow after shoveling mounds from two storms a week apart that together dumped more than 4 feet along the Front Range. "I figured eBay has ghosts and all sorts of weird stuff, so why not snow?" said Walker, who teaches business workshops on employee communications. How much snow 99 cents or whatever the winning bid gets depends. Walker's auction notice suggests avoiding shipping and handling charges by stopping by their home and picking it up _ in a dump truck. Only 10 offerings of snow are available and the proceeds are earmarked for a used snowblower for Jim or a pair of shovels. She says she doesn't really expect to find a buyer for their blizzard overstock. "We just wanted to just give some folks a laugh," she said. Some of you have already started 2007, but we haven't yet. We still have several hours to wait. I don't have resolutions, 'cause they are stupid and what's the point? I'm not going to be nicer to Lex or stop peeing on things. My Human has a couple goals. I noticed that Trixie Koontz has some resolutions, so if you want to read them, you can. The Army of Four mentioned that they'd seen my moniker over in their section of the park. Yes, like Kilroy, I am everywhere! I thought I'd share with you a picture of some of my graffiti. Unfortunately police officers are human and they were a bit angry with me! In Germany, Huskies play hockey! Say Woo to the Kassel Huskies. I'm not feeling at my best, so I'll leave the translating of German to woo. 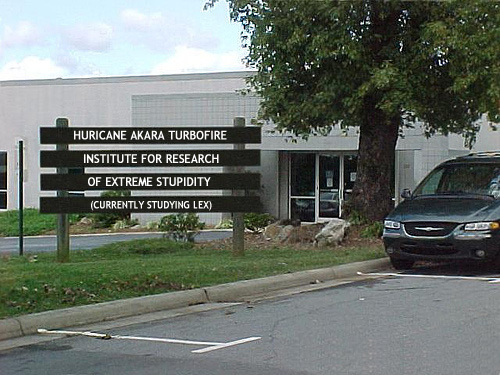 Thanks to the help of Charlie the Big Dog, I've opened up my own business. Look at me! I'm a scientist! Blogger is being stupid. It wouldn't let me into Meepie's blog to post a comment. So, I decided to help the Meep out by posting his announcement. 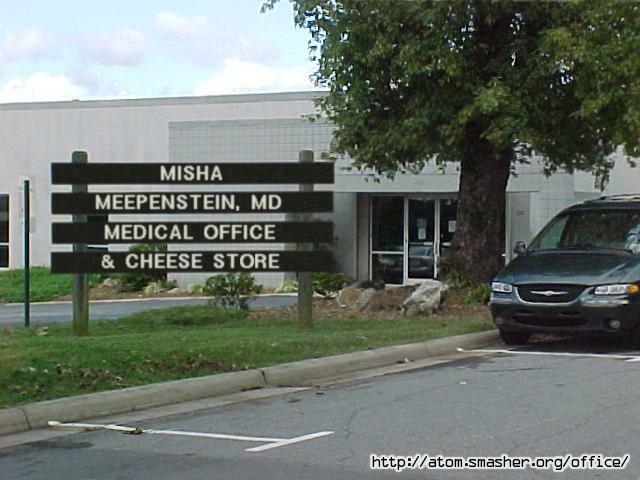 Meepie wrote, "I've decided to expand my practice..."
I like the sound of it...whatever it sounds like! Sounds like your pal Tubey is Welsh! Also, stop by Meep's blog. He has an announcement! I don't really have anything to say, so Roo Roo suggested that everyone might want to look at some pictures of her. I don't know about that, but here you go! First of all, I don't know the dogs in this picture. I found it yesterday when I was searching for my weekly husky mascot. It came from the CBC. 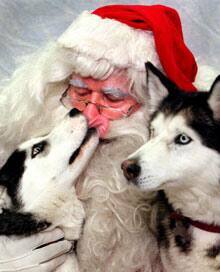 The article attached wasn't about Santa or huskies (per se). I'll just leave it at that, for now. Next order of business, I was searching through my Human's disks looking for a specific picture of Santa with Lex, Meeps, and Fargo. I couldn't find it. But I did find Trixie Koontz's (whose human is Dean Koontz the author) list of Christmas wants. I'm putting the link here. I'm not totally with her on all her wants (for instance I don't want a Garfield tattoo anywhere). And I would have added cheese and bacon. BTW, that stupid D. Animal has it's Christmas List posted. We killed another stupid no-possum that was stupid enough to wander into our yard! I'm not saying who killed it, but I'll say that it definitely wasn't Lex. He was inside the house whining at the time. But then my Human let that stupid Lex out and she discovered our treasure. So my Human tried to get rid of it, but that stupid Lex ran off with it. He's stupid, that Lex. My Human got the dead no-possum away from him and threw it away. In the Canadian province of Saskatchewan there has been a boy's hockey team called the Hustlin' Huskies. And today I'm featuring a couple of their logos that I've found. This mascot is not as mean looking as some of the others I have featured. Something that I hate (that I really HATE!) is when my Human closes the door when I'm outside. A lot of the time when she does that, that stupid Lex is inside with her. I can see her giving him attention and that just isn't right!!!! I yell at them and watch them. I think I need to put my Human on a shorter leash so that I can keep better track of her! Over at Dogs with Blogs there is a poll to determine which is best Labs or Huskies. Now, I do like Labs, but we all know about the superiority of huskies. GO VOTE!!! GO VOTE!!! GO VOTE!!!!!!!!! We live several miles outside of the city limits. A lot of animals live outside of our house. We see feral cats, NO-possums, raccoons, deer, sometimes foxes, and occasionsally coyotes. Lots of birds, too (although none as pretty as those that visit Charlie and Opy). We'd love to have some of the animals come and play with us, but they aren't taking us up on our offer. Our closest neighbor has cattle, llamas, and small goats. Again, they won't play with us! I think any animal that doesn't want to play with us is stupid! Thanks for tagging me Holly, Kelsey & Smokey, and Steve, Kat, & Wilbur. I'll list my wants & unwants at the bottom of this posting. The Rules:The player of this game starts with "3 things he/she would love to get for Christmas", and then lists "3 things he/she definitely does not want to get for Christmas." Then, he/she tags 5 friends and lists their names. The ones who get tagged need to write on their blogs about their Christmas wishes, as well as state this rule clearly, then tag 5 more victims. And, the one who tags, needs to leave a comment that says, "You've been Christmas tagged!" in their comments and tell them to read your blog. Check out the Dogs with Blogs randomizer that Charlie and his SHD made for me (on the left side of my blog)!!!!! It's my hope that all dogs who have blogs will put this on their blog in the future!!! I've mentioned a couple times previously that I really like the husky logo of Northeastern University. Today I'm going to feature a couple more of their logos. I like all of their logos so much that I can't pick a favorite! I've asked my Human why she didn't go to a university with a cool husky mascot, but she still insists that mascots aren't a good criteria when choosing a school! Congratulations to Tierre for being my 10,000th blog visitor. In honor of this even, I'm naming him an honorary member of my pack starting immediately. I'll also be sending you some snow. Holly had an idea that she mentioned in a comment to me that the Husky bloggers (and honorary Husky bloggers) in our area should meet up. I think that's a good idea Holly suggested somewhere in Kansas City, as that's a reasonable distance for most of us. My Human just got a call from a human friend in Des Moines, IA. She can see the Northern Lights now. So all huskies and their humans should go outside and look to the north for the lights. Unfortunately, it is too overcast for us to see them here. But due to the level of solar activity there is a good chance of Auroral activity for a couple days. I've updated my template with a bunch of new links. Please let me know if I missed any of you, my faithful readers! And full disclosure time now...nothing stupid has happened to me since I switched to Beta. But I'm still full of hatred that I was forced to change! I still don't understand the whole concept of "no dogs on the furniture." I mean, is it just supposed to sit there not being used? If we don't use it, won't the furniture feel unloved? I'm just thinking of the furnitures' feelings! Stupid Blogger isn't letting me post comments on my friends Beta blogs! I keep getting stupid error messages. I've tried searching through Blogger for a complaint e-mail address, but everytime I click on the link, it routes me back to a troubleshooting guide. I'm an angry Tubey tonight! So I guess I solved my stupid problem by switching to Beta. Being forced to switch is very stupid! So all the snow is gone! I don't get it. We had 18 inches of wonderful snow and cold temperatures. Then it was a miserable 55 degrees for a few days and it's all gone! Oh well...I'm going to try to not let it get me down! BUT IT BETTER SNOW AGAIN SOON!!!! The photo on the right is of Meepie on the couch and Roo Roo on the floor. My Human noticed the dogs in this position and when she went into the room, she saw that Roo Roo had her snout in the blanket. So my Human picked up the blanket and a mouse jumped out! Sadly, we didn't get to play with the mouse and my Human washed the blanket before we could smell it. I want to talk about the stupid mouse for a moment. That is some STUPID mouse! We have 6 huskies in the house and a bunch of stupid cats outside. Howdy! Today I'm featuring the husky of Paul J Hagerty High School. I found the cute picture (on the left) of what may be a new husky blogger while researching this school. I didn't start my computer usage until I was much older than this little guy. Also, I'm showing the logo of their school's ROTC program. I like it! The Husky is known for its intelligence, loyalty, courage, work ethic, teamwork and fierce competitiveness and represents qualities essential to the school and the students. So, I'm running away! Anyone who wants me to live with them, let me know. I'll be bringing the snow with me! A semitrailer dumped its load of beef livers on a highway in Sioux City, blocking morning traffic as officials worked to clean up the mess. The semitrailer careened off an exit ramp from U.S. Highway 20 to Interstate 29 about 8:30 a.m. Wednesday, blocking three lanes of traffic. The mess delayed traffic for about an hour as firefighters washed blood off the highway and then salted the area to keep it from freezing in the frigid temperatures. The driver of the truck suffered a cut on his forehead and a possible shoulder injury. He was taken to a local hospital, police said. The driver's name wasn't released. The semi, owned by Coverleaf Cold Storage of Sioux City, left the road and came to rest on its side in the median, police said. How do you wake up your humans? Meepie will poke my Human with his snout. Fargo will lick her. But I walk all over her. I'll hop up on the bed and do my tight rope act up and down her, till she wakes up. Sometimes my Human will try to ignore me after she wakes up, but I'll continue to march all over her. I don't know what she's thinking. This morning I walked on her at 4am! That's late enough for her to sleep. She's lazy. Very lazy! Humans are stupid! Have I mentioned that? I've heard about some humans who bring trees into their house this time of year. The decorate them with breakable things and lights and stick boxes with stupid paper under the tree. Those humans get upset when dogs (and cats) visit the tree. Okay, what if we brought one of those stupid vitreous china raised drinking bowls into our house and then didn't let the humans use it? I think they'd be really angry! And another thing...what do those trees have to do with Christmas? Why don't they bring trees inside for Arbor Day? My Human has said that she's never going to get us a house tree! I think she's very selfish! I don't think I'll ever understand humans! This fluffy husky is the mascot of the Alak School in the community of Wainwright in Alaska. Alak School is located nearly 350 miles above the Arctic Circle on the coast of the Chukchi Sea in northern Alaska. It is a unique place with strong traditions and friendly people. Most residents are of Inupiat Eskimo heritage. So, woo ooo to this Chukchi Husky! So we got about 18 inches of delightful, powdery snow!!!!!!! FINALLY!!!! My Human isn't going to work for at least a few more hours. The humans have decided to shut down the Interstate that my Human has to travel on. I think that humans are stupid to let a little thing like snow impede their mobility. But I don't really care, because my Human is home, and we can all play in the snow!